Licensee, Designs by Gloria & Pat, Inc. 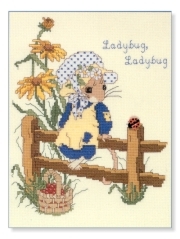 The pattern is in book # 103, "Priscilla's Mouse Tales," designed by Priscilla Hillman, and from Designs by Gloria & Pat, Inc. The pattern displays a mouse dressed in a blue and yellow dress and bonnet. The mouse is sitting on a wooden fence, with a ladybug on the fence. There is also sunflowers and lettering on each side of the mouse. Download Only: $2.97 You will download the pattern. Nothing will be mailed, so you pay no printing or shipping charges. With Supplies: $29.39 You download the design. We will send you, 27 skeins of DMC Floss & Wichelt 14ct. 18" x 21" Aida (Ivory) to complete your project.